After a rather average couple of months in the reading sphere I was lucky enough to be able to read this book as an Advanced Readers Copy. I am delighted to say it is the best book I've read this year, ten months in. In my view it worth more than 5*. Would you pay someone to bear your sorrow? During the middle ages, a peasant's superstition held that a mother mourning the death of her child could "sell her sorrow" by selling a nail from her child's coffin to a travelling peddler. Lady Celeste is overwhelmed with grief when her infant son dies. Desperate to find relief, she escapes the convent where her husband has sent her to recover and begs a passing peddler to buy her sorrow. Jean, the cynical peddler she meets, is nobody’s fool; he does not believe in superstitions and insists Celeste include the valuable ruby ring on her finger along with the nail in return for his coin. Jean and Celeste both find themselves changed greatly by their transaction, but all their attempts to reverse the effects of their fateful choice fail. When Celeste learns that without her wedding ring her husband may set her aside, she determines to retrieve it—without reclaiming her sorrow. But how will she find the peddler and convince him to give up the precious ruby ring? 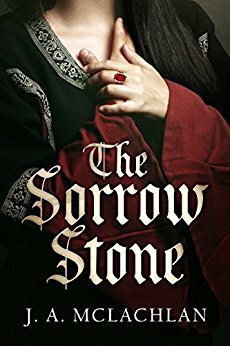 If you like realistic medieval fiction with evocative prose, compelling characters and a unique story, you’ll love this incredible, introspective journey into the south of France in the 12th Century. Buy The Sorrow Stone and begin your journey today. WOW! This is the best book I've read this year. Superbly written. Set in South of France during 12 Century it is the story of Lady Celeste and a peddler called Jean. The book gripped me from the beginning to the end. I’m almost stuck for words – good, superb, brilliant and many more adjectives in the same vein, to try and do this book justice. The story encompasses the time brilliantly, from barbaric acts to acts of kindness, from superstition to religion to heretics, the poor and the rich. It evokes everyday living from the smells and sounds of the straw on the floor to the dangers of travelling the road alone. How grief can consume somebody’s mind, how superstitions can play havoc with the mind. If you like historical fiction set in medieval times then this is a book you will enjoy reading. I was gripped by the story, by the writing, by the emotions evoked by this book. I do hope there are more books to come by this author. I love good historical fiction so I'll put this on my list. Thanks! Medieval time is not a common subject for historical fiction. Nice to see. I love reading about the old days. It is always like a journey into the past. This is a unique premise I've not heard before and I love the way historical fiction entices me to learn more about the time or subject matter.